Regarding antiviruses, there are a plethora of logical options. We all use the internet differently and inn order to help you choose, we’ll determine which security suite suits which user profile. After closely analyzing most of 2017’s suites, one thing is for certain: these solutions have a rather limited impact on performances, and their efficiency is superior to the basic defense tools built into Windows 10. 4.1 1 – Should we still pay to protect ourselves? 4.2 2 – What is the difference between a suite and an antivirus? 4.3 3 – Is the Internet really dangerous? Am I unsafe, even if I don’t download and don’t visit pornographic websites? 4.4 4 – A suite does it slow down my PC? 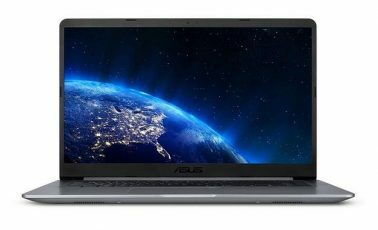 4.5 5 – Can we have the same antivirus to protect the PC and mobile devices? 4.6 6 – Can it be trusted to publishers less known? 4.7 7 – Can we trust lab tests? 4.8 8 – Why is it so difficult to stop adware? 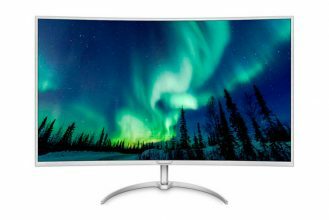 We have noticed a trend: suites include more features, including PC optimization, and take into account the diversity of devices in the household. But, besides BitDefender, all the publishers must do better integrating their mobile solutions and offering the possibility of controlling everything from a single interface. In general, we can note that some suites are very close in terms of efficiency: Bitdefender, Norton, Kaspersky, Panda and even ESET shine by the quality of their protection, the other suites are aimed at a public using the Internet less intensively and therefore, are less exposed. Because there has to be winners, we find Bitdefender Internet Security 2018 (Official Site) and Norton Security (Official Site) standing out with its efficiency, performances, user-friendliness, and is shaping up to be one of this year’s favorites. It really is a family-oriented suite at heart. While Kaspersky 2018’s (Official Site) defenses the most advanced technically, yet still very easy to use, Norton Security (Official Site) seduced us with the quality of its defenses and its multi-devices approach, bringing excellent value. 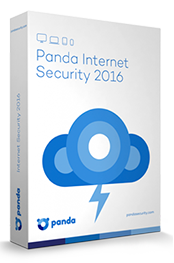 Panda (Official Site) is ever-efficient, fast, and economical in terms of resources with anti-theft functions for your PC. And ESET will not disappoint its fans because the suite is nice, efficient with a twist of technicality that is well-appreciated. And regarding the light and minimalistic suites, this year again, we particularly appreciate F-Secure and Trend Micro. 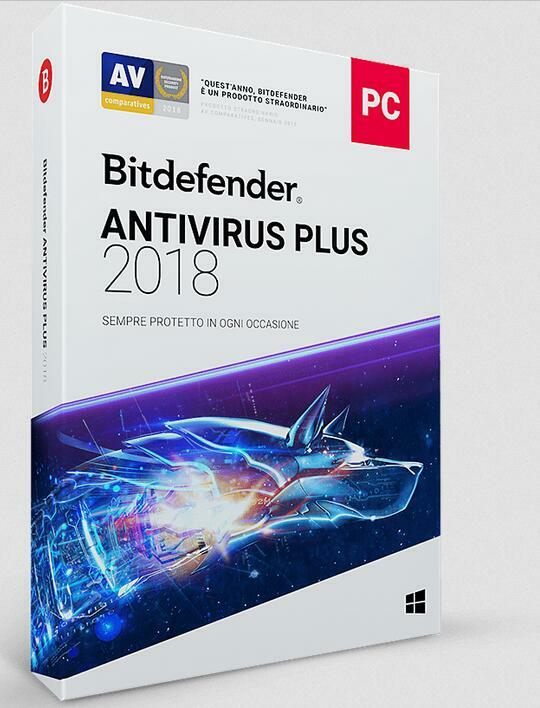 Bitdefender Antivirus Plus offers the ultimate protection against the latest online threats including those that stem from professional hackers and identity thieves. With a rich set of security features and intuitive user interface, it is on our list of the best antivirus software on the market. The software has repeatedly delivered strong results in terms performance, level of protection, and in the ease of use category. The company is also committed to providing excellent customer service experience, making their representatives available around-the-clock to respond to your queries. The Autopilot mode is the preselected mode in Bitdefender. It autonomously adjusts to the job without any manual user interaction. By shifting between configuration profiles and basing on what you are doing, it chooses the one that is most appropriate. It keeps it’s pop-ups out of the way, ensuring that they do not interfere with screening a film or playing games. The Autopilot mode can be switched off and you can manually select between the Standard, Work, Game, or Movie profile. The performance reports are based on the findings from the AV-Test, an independent testing lab. In August of 2016, the Bitdefender was compared with 20 other antivirus programs under a set of controlled conditions. The software was installed on PCs running Windows 7. Then the product was allowed to run and update automatically. Bitdefender was judged on 3 grounds: protection, performance, and usability. In all three areas, the Bitdefender Antivirus Plus software’s scores were either at par with or exceeded the standard scores. In protection testing, the software was tested for the level of security it can provide against viruses, worms, and Trojan horses. The AV-Test had subjected each of antivirus programs to 15,151 samples of malware that were collected from various threat databases. From the easy to detect known malwares that were recorded in a threat database to the zero-day malware that offered a real challenge due to their unknown statuses, Bitdefender had successfully detected all the malwares,. Bitdefender scoured the PC for such malicious files by staying alert to any kind of suspicious behavior. It recorded 100% detection rate for zero-day malware by detecting all 162 samples that were used in the AV-Test. That was 2% higher than the industry average of 98%. The performance test investigated how the antivirus program affects computer speed. This included website load speeds, speed of installing and running applications, and copying of data files. Most antivirus programs resulted in a 3 second slowdown while Bitdefender did not cause a PC slowdown. Finally, the AV-Test’s usability feature checked the accuracy level of the program. An antivirus program with false positives is not a good one since there is a tendency to flag harmless content as being malicious. Such false detection might compel a user to ignore the safety warnings in the future. Only a single detection incidence of legitimate software being flagged as malware occurred in Bitdefender’s case. Autopilot mode for a no-hassle protection. 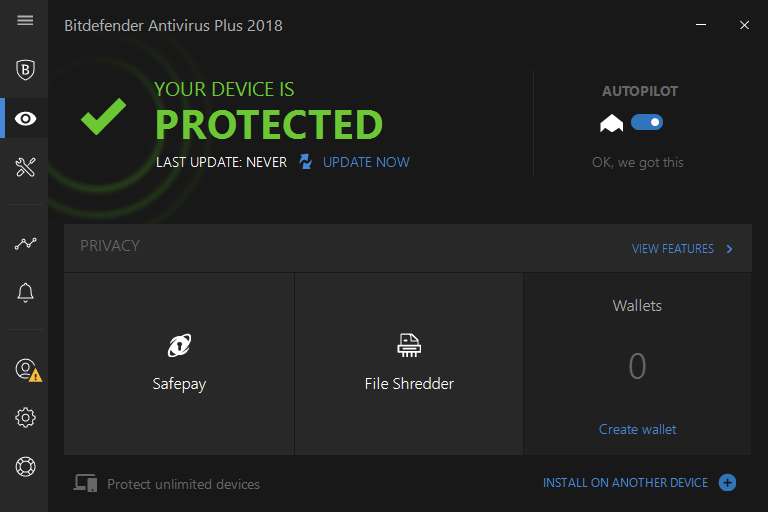 There is no denying the Bitdefender Antivirus 2018 is the best recommendation for commercial antivirus. Analysis Very convenient to use and really efficient, Bitdefender internet security 2019’s biggest asset is the efficiency of its protections. The most complete suite on the market, including a custom control panel to manage parental control as well as the protection of all your PC, Mac, smartphones and android tablets. Excellent value. The most efficient shields on the market. This suite is very solid against unknown threats and phishing. Its parental control is super–efficient, but too local to the PC. Very good PC protection with an excellent scan and good proactive defenses. Suitable to those engaged in risky behaviors (heavy downloaders, pirates…) With no impact on the PC’s performances, ESET protects PC and mobiles. We just would have liked more features for the price. ————————————————————————————– Great Discount for New Bitdefender 2019 Buying now and Get Up to 60% Off! In short, what one must remember from this 2017 comparison is that the defences of Kaspersky Total Security 2017 remain the most advanced – technically speaking – while remaining very simple to use. We particularly like its new control center on the Web. However, this year the suite is heavily put at a disadvantage by an imperfect Windows 10 compatibility (some of its shields are not available on the new Microsoft’s system). It still remains the one to recommend to professional users who like to have a tight control over all aspects of their security and who want to know exactly how their system functions. Nevertheless, its user-friendly interface makes its use easy even for the novices. Important Update: It is important to point out that the main defects we had identified during the Kaspersky Total Security 2017’s test have been cleared with the February 2017 update. Now, Windows 10 is fully supported and all the protective shields are operational under the new OS. Similarly, the use of virtual offices no longer disrupts the functioning of the protection. In addition, notifications produced by the suite are now integrated in the Windows 10 notifications’ center. Update 2: Kaspersky has released its new version Kaspersky 2018 series, according our test, it doesn’t have any compatibility issues with Windows 10. Bitdefender Total Security 2018 is as always very convincing on the quality of its defences and its fully accomplished multi-devices approach which provides an excellent quality/price ratio. It is an excellent solution which deserves the first place on the podium. Having said that, we would have liked more novelty and boldness in this edition that rests a bit too much on its laurels. Bitdefender remains a family suite which is suitable to the majority of people, advanced users as beginners. Eset Smart Security is undoubtedly very effective, fast and economical in resources. The suite offers “Anti-Theft” functions on PC worthy of those available on mobiles. It is directed to a public who loves advanced protections on which one can configure firewall and HIPS according to one’s own needs. However, one could regret the high price which does not match the competition nor its lack of functional richness. McAfee Total Protection is less greedy and more effective than its previous 2016 edition. It becomes the suite which has progressed the most in our testing without actually charming us despite an ‘enticing’ price but above all the user interface is really old fashioned not to say unbearable to the use, inadmissible for a suite rather oriented toward the casual users. This said, it is the only one to play the card of the unlimited number of machines to protect. Speaking to the greatest number, Avast Premium obtains overall excellent results and offers amazing modules such as the network analysis, the automatic update of Software or the cleaning of browsers. Unfortunately, it suffers greatly from a lack of functional richness (no parental control for example), and many of the functions present in the interface are to be acquired separately, such as the Optimizer Performance or SecureLine VPN. In the end, this suite’s fee is struggling to justify the investment it calls for in the face of the effectiveness of its free version. Finally, this year we are taken with – Norton Security . Even if it still lacks a true unified portal to completely manage all the protections of the home from a single interface on the Web, the suite is family- friendly, amazingly efficient, very pleasant to use, and intractable in the face of adwares and phishing. Sometimes it even gives the impression of speeding up Windows 10! 1 – Should we still pay to protect ourselves? Times are tough for security software publishers. Windows 8 and Windows 10, with its many built-in protections (advanced firewall, anti-malware Windows Defender, anti-phishing IE11, smartscreen IE11 and NTFS), provide a good level of protection by default by blocking the most common attacks. Moreover, all users have known for a long time that free antiviruses such as Avast, AVG or Avira detect malware as efficiently as their paid counterparts. So, what is the point of adopting a paid security suite? Security suites offer better ergonomics. First, they don’t display popups or ad banners (encouraging you to purchase the paid version, for example). All the protections are integrated and managed through a single interface: It’s easier and more efficient. A suite offers entirely free support in English. For example, Norton bundles in its 2015 suite a service allowing an engineer to help you step by step to eliminate a threat (and can even do it remotely). If the engineer can’t solve the issue, Norton will refund your purchase! Security suites’ protection goes beyond malwares. While free products focus on defending the computer against malware, suites will also protect your data, your identity and your children (see below) as they are browsing the Internet. Suites include optimization tools. They generally consider the health of your PC as a whole and include optimization tools. Today, suites aim at protecting the household and all its devices. They are “multi-devices”, meaning their licenses cover tablets, smartphones and Mac as well as PC. 2 – What is the difference between a suite and an antivirus? Antiviruses, free or paid, protect you from executing malicious code on your PC. They should actually be called “anti-malware”, since viruses have almost entirely disappeared, replaced by Trojan horses, spywares, adwares, bots, banking trojans, bitcoin miners, worms, ransomwares, rootkits, keyloggers, rogues, browser hijackers (BHOs), droppers, downloaders, RATs, exploits, etc. Therefore, we prefer calling them “malicious code”, or “malware”, rather than “viruses”. But, to efficiently protect yourself from such a range of threats, you need to multiply your defenses. Suites include several shields (firewall, web protection, cloud reputation, behavioral analysis, HIPS, etc.) interacting together to better protect you. Besides, suites will not only protect you against all these dangerous codes, or malware, but also against the websites spreading them and other traps you’re exposed to (phishing, water holes, etc.). 3 – Is the Internet really dangerous? Am I unsafe, even if I don’t download and don’t visit pornographic websites? Yes the Internet is open, readily available, and allows to one to anonymously act from wherever on the planet, is a useful, albeit dangerous space. Any website, even among the most popular, can become compromised or dangerous because the ads it displays come from compromised servers. Lately, our lab has detected threats while visiting the Google image search page the AOL, Yahoo, Match.com website, and more. Contrary to popular belief, malware doesn’t primarily spread through pornographic websites, but rather through blogs (mainly those dedicated to the pop stars), illegal websites broadcasting live sport events, illegal download websites and torrents, newsgroups and social networks (through links posted on Facebook and Twitter). To give you an idea encrypted, in 2013, the guards Kaspersky have neutralized more than 5 billion of cyber attacks on the devices to their users (or roughly 16,000 attacks per year and per user or an attack all half-hours for each site visitor)! Almost two billion of them came from Web sites. If the dangers are also numerous, it is because there is today of “kits” and “services” which allow any person to bring attacks without any prior jurisdiction: “Even your grandmother can today be transformed into criminals”, was recently explained by Raj Samani, CTO of McAfee. 4 – A suite does it slow down my PC? The first concern for users is that the security suites can slow their machine. It is true that some products have greatly contributed to this reputation, as has been the case for Norton 2008/2009, the first versions of Avast, etc. But, today, we must recognize that with our multi-core processors and the constant concern of publishers to optimize their protections (Norton is today the most swift of suites for example), the slowdowns are no longer sensitive. Be aware that malware, spyware, adware and other crapwares installed on a PC can impact much more its performance than the slowest of the suites of the market. Finally, security suites often incorporate optimization features to which erase the temporary files which inflated Windows, who clean the registry database, that defragment the disks, which manage the unnecessary software that slows down the startup. 5 – Can we have the same antivirus to protect the PC and mobile devices? The mobile (smartphones, tablets) use different operating systems on your PC, the publishers must therefore create the protections specifically for these devices. Most of the Security Suites stamped in “2016″ are nevertheless declined in versions “multi-devices”. Their license therefore includes the installation on PC, Mac, smartphones and tablets, with versions adapted to each device. However, the real challenge today is to deliver the protections that we can control centrally: from your PC or a Web interface, you must be able to verify and configure the protections of all devices of the home and including tablets and smartphones of children. In this regard, BitDefender is the more advanced publisher in this unification. McAfee and Norton are approaching, but their centralizing console is not yet as successful. 6 – Can it be trusted to publishers less known? An actor known is a publisher whose protection is very widespread. However each installed protection acts as a sensor which prevents its Cloud that a dubious program has been detected or that a site potentially dangerous has been marked, in order to protect more quickly all the other users. In other words, the more protection is well disseminated in a country, the more likely it is that to be effective to protect the users of this country. It is for this reason that the publishers known very often have the best Webs defenses. It is also for this reason that Bitdefender, antivirus the most popular in US, is so effective on the threats encountered by the US surfers, but possibly less effective for other users. Lastly, never forget that no protection is 100% reliable. A system, whatever it may be, can always become compromised. Because its user is the weakest link of the chain and can ruin the efficiency of the protections by his or her actions. 7 – Can we trust lab tests? Security is a complex field. Developing an efficient protection requires a lot of time, energy and skills. Testing a protection requires just as much time, energy, skills and technical means. It does not just happen. Just because we gather a dozen malicious pieces of code on random Chinese websites and check that a suite can detect them, doesn’t mean it works. Different test labs can be found throughout the world. Every test is performed at a given time. In that regard, every test is the piece of a puzzle. What matters in the end is knowing if this puzzle is leaning toward green, orange or red. – On the one hand, we focus on the threats the US or other English-speaking countries are most likely to undergo. – On the other hand, we pay special attention to proactive defense, meaning the suites’ ability to defend itself against unknown malicious code of phishing sites. To this effect, the lab has been developing original tests for several years. These tests are enriched and enhanced every year, as threats and defense are always evolving. 8 – Why is it so difficult to stop adware? The US is one the countries most affected by adware, toolbars and browser hijacks, displaying ads at all times. These intruders are not necessarily dangerous (they only display ads), but they can eventually become dangerous because those ads may be hosted on insecure servers, or worse, be hosted by cybercriminals. Most of the time, those toolbars are getting installed because the user forgets to uncheck the boxes allowing their installation. In light of the recent adware invasion, security suites publishers are more active than ever. These toolbars slow down web browsing, pollute web pages even when they don’t normally show ads, or even compromise the system’s stability and performances. Avast, for instance, offers a cleaning tool called “Browser Cleanup”. The “Power Eraser” tool from Norton also eradicates these threats. Lastly, a free tool is specialized in the annihilation of these threats: AdwCleaner. Previous Buying a Ryzen motherboard: Which Chipset, Manufacturer and RAM is right for you? I used a paid version of Avast – support for the client was not very pleased, but the antivirus itself worked well. But I did not want to buy a license for each device separately. Therefore, for myself, the bitdefender family pack has been opened – one license for all devices: PCs and mobile devices. Families with children will be pleased with well-designed parental control. If you are like me in India, buy only from the official representative https://bitdefender.in/ – there is included in the price extended support. A very keen and detailed study about these top antiviruses. Good job! Maybe next time you can include ESET Antivirus in the list. I have been using this software for a time now in my firm. And I have been reading good reviews about it. In my experience, it never gives me a headache.